Back to school, back to reality as they say, right? No that's not really indicative of my mood. I've actually had a really relaxing holiday and as such I feel refreshed and ready for the new year. Who's with me now? The start of a year (and a decade at that) should be full of hope for what's to come and I'm definitely feeling that vibe. 2010 is going to be full of great things. One of those is good health and as such I (and I suppose about 5 billion other people around the globe) have embarked on a healthy eating and exercising regime. I do eat pretty healthily already I must add, but of course there are always ways to up the ante. Like say, stepping away from the chocolate every once in a while and attempting to turning a blind eye to all the delicious sweet treats tempting me on Tastespotting. Hmmm, maybe I could sue them for the extra poundage I am currently lugging around? Or maybe I should have one of these Black Bean Burgers instead to satisfy my tastebuds AND be healthy at the same time. Agreed? 1. Grind the coriander, cumin and black mustard in a pestle and mortar until coarsely ground. 3. Place the patties on a greased oventray and freeze for 30 minutes to firm them up. 4. Bake at 180C for 30 minutes until crisp on top. Will still be slightly soft inside, but should be cooked through. Serve on a fresh bun smeared with a dab of creamcheese (or leftover labneh if you like), slices of cucumber, gherkins and a drizzle of sweet chilli sauce. Oh Yum. With a capital Y. And italics. And an exclamation mark. 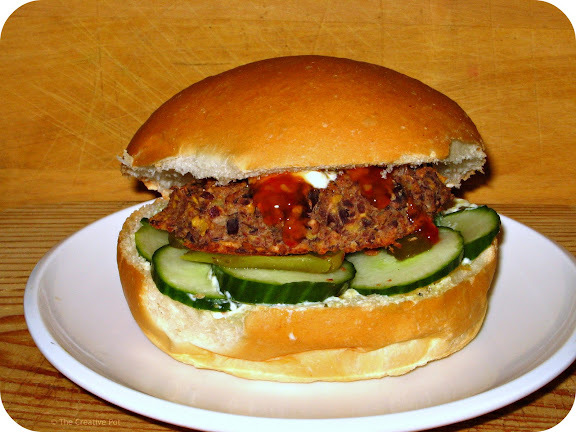 Black bean burgers is such a healthy alternative and so delicious, you won't even wonder "where's the beef?"